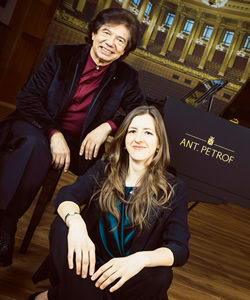 Winner of the 2010 Nadia Reisenberg award for pianists in New York City; laureate of international piano competitions in Mexico, Unites States, Canada and Ukraine; a noted soloist and chamber musician, Vlada Vassilieva has performed at the principal concert venues in America, Europe and Asia. Fulbright Garcia-Robles grantee in 2008; performing fellow by the National Foundation for Culture and Arts in Mexico in 2007; MM at Mannes College for Music in New York City, BM at the Fine Arts Institute of the University of Colima, Ms. Vassilieva is a faculty member at the Music Department of the University of Colima since 2006 and guest faculty at the National Music Conservatory in Mexico. Audience and critics alike appreciate her mature performances, impetuous character and stage presence.